Think of this as a more sensible version of the Thickburger. I’ve always been a big fan of putting potato chips in burgers, and it looks like in Japan, fast food chain Lotteria is, too. 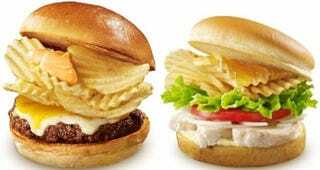 Lotteria, never one to shy away from interesting burgers (here, here, here, and here, for example), is offering two kinds of potato chip burgers. There’s the Zeppin Cheese Potato Chip Burger and the Salad Chicken Potato Chip Burger. Both are stuffed with crisps from Japanese potato chip maker Calbee and special sauces. Both go on sale this week in Japan, and according to Entabe, the cheese burger is 420 yen (US$3.39), and the chicken burger 390 yen ($3.15). The actual burger doesn’t look so bad!